Green Hands - How Big is a Hosta? Many people think "Hostas? Ho-hum," picturing rather plain green plants  or with a white stripe  medium-sized, with not very interesting flowers, whose only virtues are that they are easy to grow, they crowd out weeds, and they grow well in shade. However not only are there hostas worth growing just for the flower, but the great virtue of these plants is the choice they offer in the appearance of the foliage: size, shape, texture, color, variegation.... Take just size, for example. The biggest hostas are impressive presences in a garden. Even as foliage alone, they hold their own next to the showiest rose bush. For example I've got a 'Champlain' rose, with deep, rich red flowers, next to a 'Blue Betty Lou' hosta: four foot wide, two foot tall, with silvery-blue, puckered leaves each as big as a whole bouquet of the roses. They really set each other off; unfortunately Betty is crowding the rose. I knew when I bought this hosta that it would grow big, but I still didn't give it enough room. Eventually I'll divide it, but this time I'm going to move the rose over. Bright, yellow-leaved 'Sum and Substance' fifteen feet away, grows in full sun (unusual for a hosta). As big as 'Blue Betty Lou', it balances her visual weight. There are lots of little plants growing around these giants; the size difference intrigues the eye. This visual interaction is central to the art of the garden. At the other extreme, one of my smallest hostas, 'Pandora's Box' grows at the foot of a big Linden tree. The hosta leaves are an inch and a half wide, with a shape that's fat, almost oval, but with a point; the edge is green and the center is a wide, jagged blaze of white. 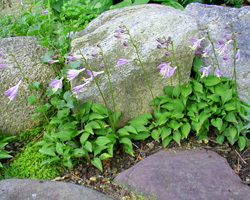 The whole clump is only ten inches wide, and five tall (except for the flower stems, which rise to ten inches). This plant is  there's no other word for it  cute. Just as with the giants, there's something about this size too  this littleness  that fascinates the eye. 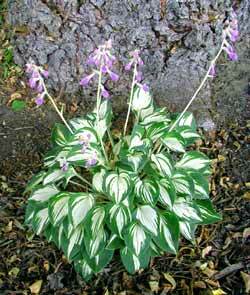 The tiniest hosta is H. venusta, with leaves two inches tall, flower stems seven inches. People's jaws drop when I show them this miniature, growing between a path and a r etaining wall, and tell them it's a hosta. Just last week one gardener confessed to me that I had changed her whole attitude toward hostas, by showing her this plant.